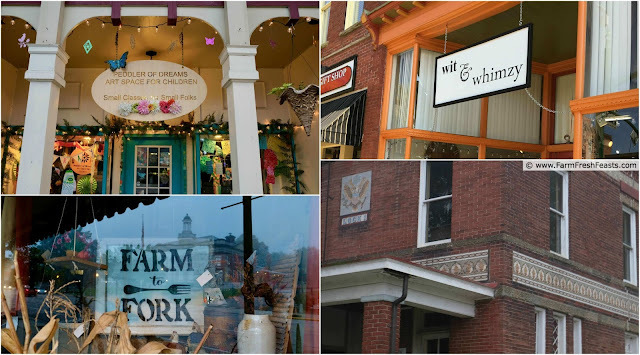 In this post I share where to stay, where to eat, and what to do for a girlfriends' getaway in Marietta, Ohio, Part One of my series on Agritourism Adventures in Marietta. If you and a few friends are looking for a weekend getaway, read on. If you'd like to take your honey off for a Couples Weekend, read the Couples Getaway to Marietta, Ohio. If you'd like to bring the kids, please read my Family Guide to Marietta, Ohio. 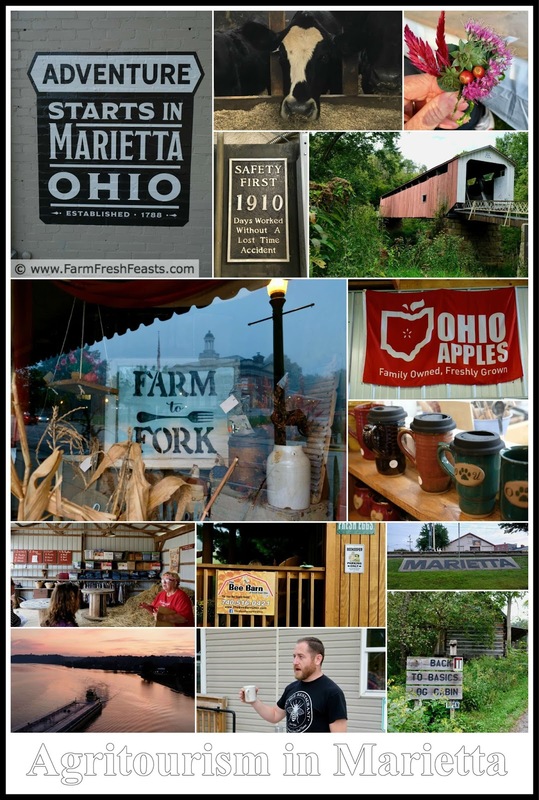 Disclosure: I spent 3 days in Marietta, Ohio on an agritourism press trip. I was put up, fed, and shown the sights courtesy of the Marietta CVB. In exchange, I have written this post--and the two that will follow, since I'm so charmed by this town and I think ya'll should visit. Why not have a getaway weekend with your friends? I think women, especially mothers, don't treat ourselves with the same nurturing we provide to others. When I was telling my friend Cathy about my recent visit to Marietta, Ohio she said "we should go there". It NEVER occurred to me to plan a girls' weekend vacation, but why not? There's plenty to do and see around Marietta, and it's a nice drive from many larger metro areas in OH, PA, WV and KY. In this post I will share where to stay, where to eat, and what to do in Marietta, Ohio. First things first--where to stay in Marietta, Ohio. [I keep adding the Ohio part so you don't get confused with another Marietta.] I stayed right downtown by the Ohio river in the historic Lafayette hotel. I had a clean & comfy room in the Hoag addition with a nice view of the river--not that I lingered in my room! Staying in the Lafayette was convenient to many restaurants and shops, and the ability to walk right out the door and see a great blue heron fishing for breakfast along the river . . . well, that's not a sight you usually see steps away from a thriving business district! It was very convenient to easily walk 'home' after viewing a spectacular sunset. Now that you're settled in, let's talk about food--because this is a food blog and I'd be remiss if I didn't share about the yummy meals Someone Else Made for Me in Marietta! In addition to the Lafayette (French toast for breakfast was quite nice) I sampled several restaurants within walking distance of the hotel. If you like to start the day with a caffeine hit, stroll down to Jeremiah's Coffee House. I'm not a coffee drinker, but if you like tea, their house chai blend was exceptional--spicy, not cloyingly sweet like the usual national chains, and being on the road means I can't make my DIY Iced Chai. There's baked goods and comfy chairs if you want to linger, and you're welcome to keep it green by bringing your own mug if you like. For heartier breakfast fare (think pancakes the size of a Costco pie!) or a locally-sourced lunch, stroll across the Lock Bridge to the Harmar neighborhood and Busy Bee Restaurant. Larry, the owner, is so committed to locally-sourced products that they churn their own butter from Snowville Creamery cream! I'm a fan of corned beef hash, and when the brisket is corned in house, well, I had to try that. For coffee drinkers, Busy Bee supports a local business, Broaster's Coffee, run by a young entrepreneur named Ashton. Our group dinner at The Galley was fun. We shared several appetizers, and I thought the Blue Cheese Kettle Chips were particularly good. Since I'd been eating out so much, I had veggies with my lamb burger and they were perfectly prepared. The service was terrific for our large group, and it was nice to window shop on the way back to the Lafayette hotel. Speaking of shopping, that's one of the activities I suggest you do on a girlfriend's getaway in Marietta, Ohio. I hate to stereotype, but there's so many cute little shops and boutiques with eye catching displays (Tonya took wonderful photos--check them out!). I was glad I didn't have the kids or spouse with me so I could poke around at The Cook's Shop, Green Acres, and Wit and Whimzy. Here's a list of local shops in downtown Marietta, Ohio to tempt you! When you're ready to venture away from the historic downtown area, I've got 2 stops for you and your girlfriends in and around Marietta, Ohio. First, check out the Back to Basics Log Cabin. Amanda, the owner, is a local entrepreneur--sort of a theme on this Agritourism press trip--who believes in educating everyone who steps across the threshold (handmade by her husband) of her business. I learned much from Amanda and her assistant Mandy during our tour & my mineral make up makeover, and I bought some natural products (soaps and serums) for the household--including the dogs! Do be sure to try the Healthy Balance tea, it's wonderful. For someone who's more into canning than skin care regimes, it was an easy change to swap a bar of honey & lavender soap (made from bee hives right on the property) for my previous face wash, and my skin is noticeably softer. 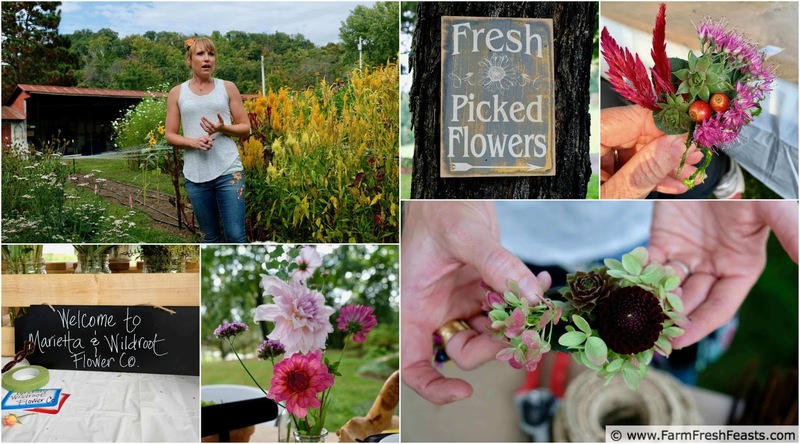 My favorite stop was visiting Lyndsay at Wildroot Flower Company for some Wine and Design. You know how your girlfriend outings often create more STUFF (painted pottery, paintings, extra padding on the hips)? During the flower growing season, it would be terrific to learn to design live flower jewelry. Lyndsay is a patient teacher, and with her guidance we made bracelets, rings, and hair bands with fresh flowers. It was fun to wear our creations as we shopped in the downtown district where we saw Lyndsay's fresh flower CSA bouquets. Oh--and the Almondera from Marietta Wine Cellars is yummy! 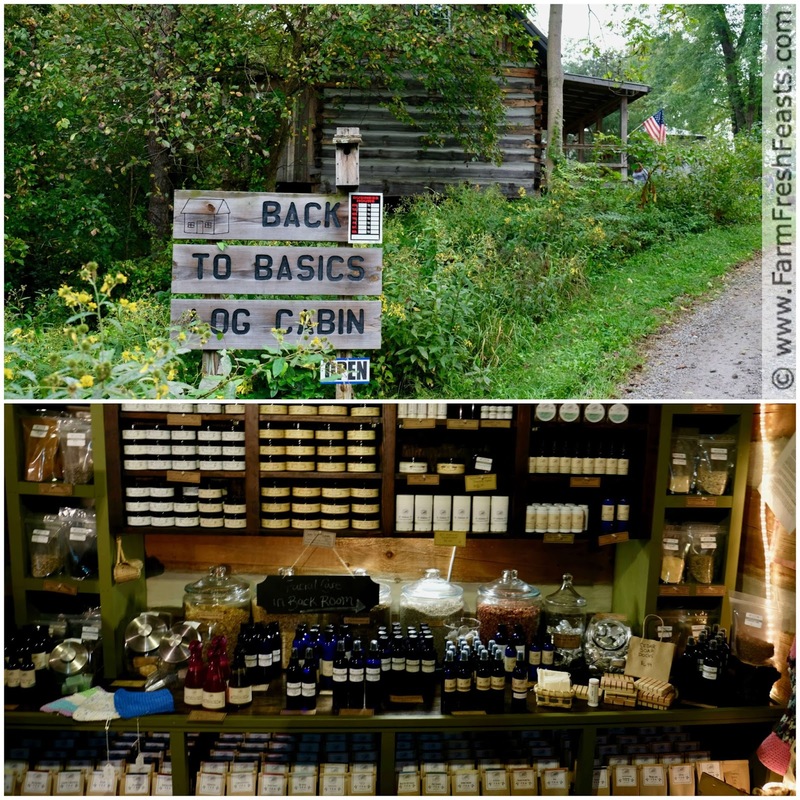 I hope you've enjoyed the first installment of my Agritourism Adventure in Marietta, Ohio. Stay tuned for the Family Guide to Marietta, Ohio and the Couple's Getaway to Marietta, Ohio! I'm sharing recipes on my Pinterest boards, follow me there. If you like a good peek behind the scenes like I do, follow me on Instagram. Need a good read? I'm sharing articles of interest on my Facebook page, follow me there. Want to know How to Use This Blog? This town looks so quaint and I love the local support for other business. I'll have to add it to our travel list; it looks perfect for a family getaway.